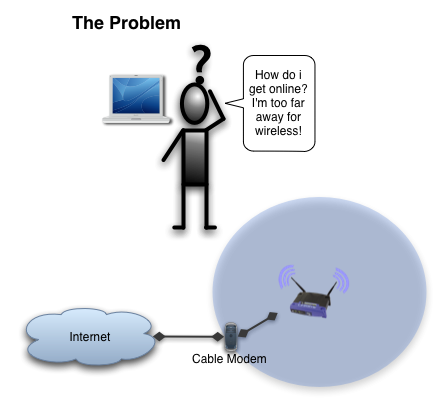 Instructions for setting up your own wireless mesh with a captive portal are located in the Setup Instructions. 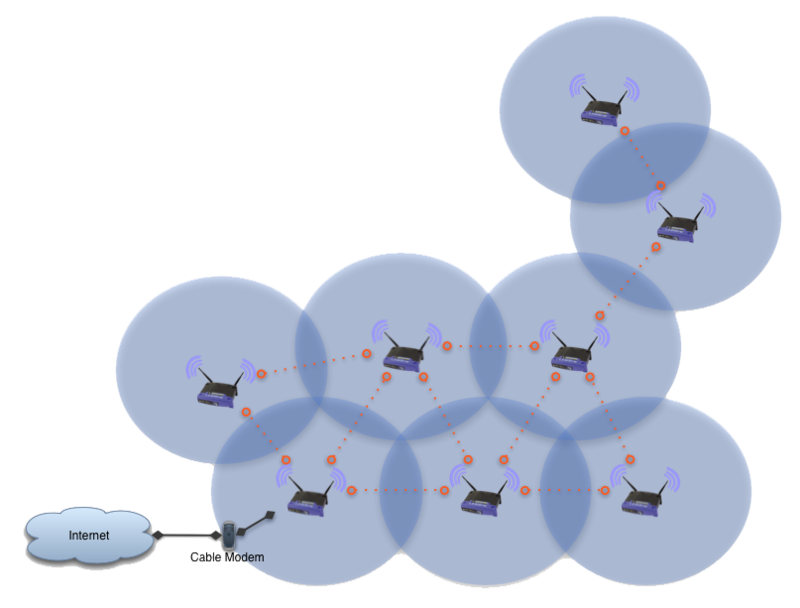 We will be using freifunk firmware and chillispot captive portal on linksys WRT54G routers. Create a scalable wireless mesh network capable of delivering an internet connection to a large residential, commercial or education building for less than $50 a month and less than $500 in initial costs. Create a method for adding and removing users from the network. Create documentation that would allow the project to be replicated in multiple scenarios. Many commercial and education buildings have only one connection to the internet. Many residential buildings have only one broadband internet subscriber. Document the configuration process for building a network consisting of 8 inexpensive wireless devices. 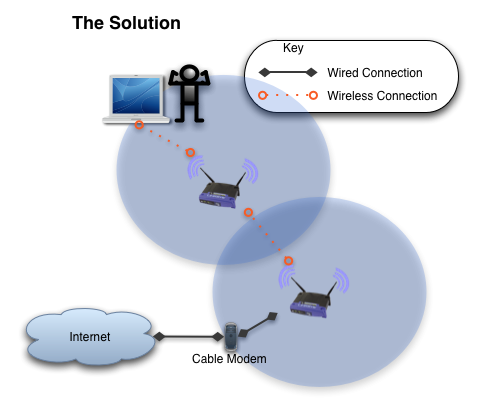 The documentation will allow the network to be recreated and deployed in many different places where wireless is needed. Why use linksys WRT54G routers? Very common, easily purchased for $40 to $50 used. 2 large antennas allow these routers to cover a good sized area. Compatible with freifunk firmware to allow customization. The WIRDS.NET project seeks to provide a methodology for distributing a single internet connection across an entire building for less than $500. The project consists of a mesh network (with 8 nodes), a user access control system (captive portal), and a website with information. The project has successfully configured and deployed 8 routers, forming a single wireless network which flooded an entire building with wireless signal. The project utilizes the website at http://wirds.net to show how to build a wireless mesh network with custom firmware on WRT54G Linksys routers. The website is a collaborative wiki where users can learn and post their own experiences. This page was last modified on 19 October 2013, at 10:46. This page has been accessed 107,956 times.